As most of you know – Lila has just started to be “OK” outside, as in we have never been able to put her down outside and have her be fine with that. This week she finally started to LIKE being outside (only in our own front yard/driveway). She runs to the door when we open it now! Awesome, right? Well, in the past couple of days we’ve run into a big problem… guess where she wants to go? She RUNS full-speed down to the street, and tries to sit down with her ping pong balls to play. We have to scoop her up and she instantly starts shaking and screaming bloody murder. Someone saw this happen yesterday and literally stopped their van in front of the house to shake their heads and stare at us. On a serious note: obviously this is dangerous behavior and we will find a way to remedy the situation. I’m honestly shocked at how she’s gone from being so timid outside to literally running down the street. She has never responded to her name. 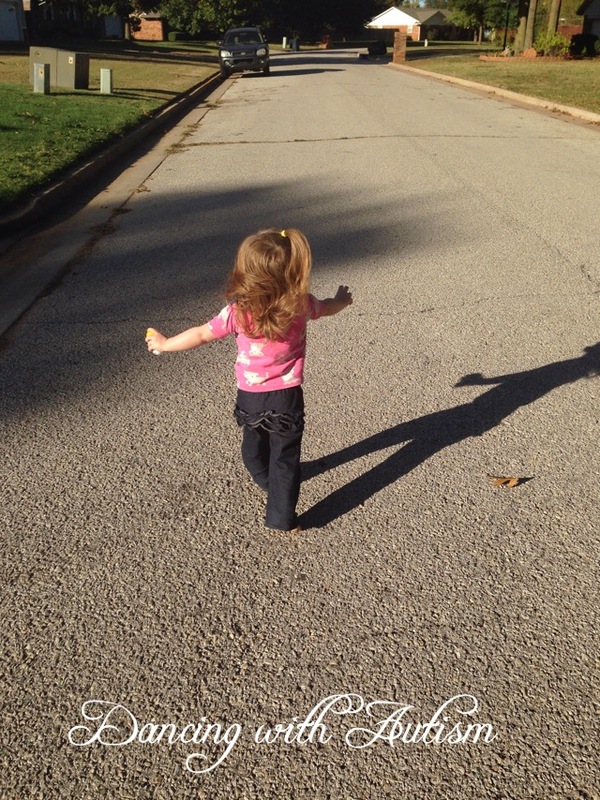 She just takes off as fast as she can and doesn’t even look back…. She has NO FEAR. And that – for me anyway – is terrifying.